Sea-Monkeys, X-Ray Specs, and a necklace full of soil from Dracula’s castle are among the many bizarre items that were sold in comic-book ads of yore. 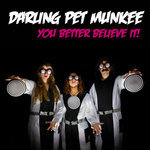 Garage/surf rock supergroup Darling Pet Munkee aims to tell the tales of these lost items in song. For the next 6 months, the band will be releasing one song a month - with accompanying history - examining the bizarre knick-knacks sold via these misleading ads that promised fighting skills, wondrous creatures, and grand journeys. 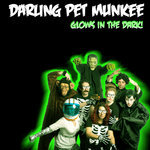 In early 2012, the full 7-song EP, _Glows in the Dark!_ will have been revealed. The band name is derived from both the sale of living squirrel monkeys via ads (“Darling Pet Monkey”) and the combination of Sophia Cacciola (drums, vocals) and Michael J. Epstein (bass, vocals) of The Prisoner-themed act, Do Not Forsake Me Oh My Darling, and Catherine Capozzi (guitars) of Axemunkee. Sophia Cacciola and Michael J. Epstein together make up Do Not Forsake Me Oh My Darling, an angular drums/bass duo performing songs based on the ‘60s spy-fi cult-classic, The Prisoner. The band is currently two EPs (April 2010's The New Number 2 and June 2011's Questions Are a Burden to Others) into a project to write and record 17 songs, each one based on/inspired by an episode of the series and has recently released a painstakingly accurate, music-video recreation of the opening sequence of the show, The Prisoner, for their song, “Episode 1 - Arrival.” The pair also perform in the library-themed baroque pop ensemble, The Michael J. Epstein Memorial Library and the intergalactic children’s band, Space Balloons.